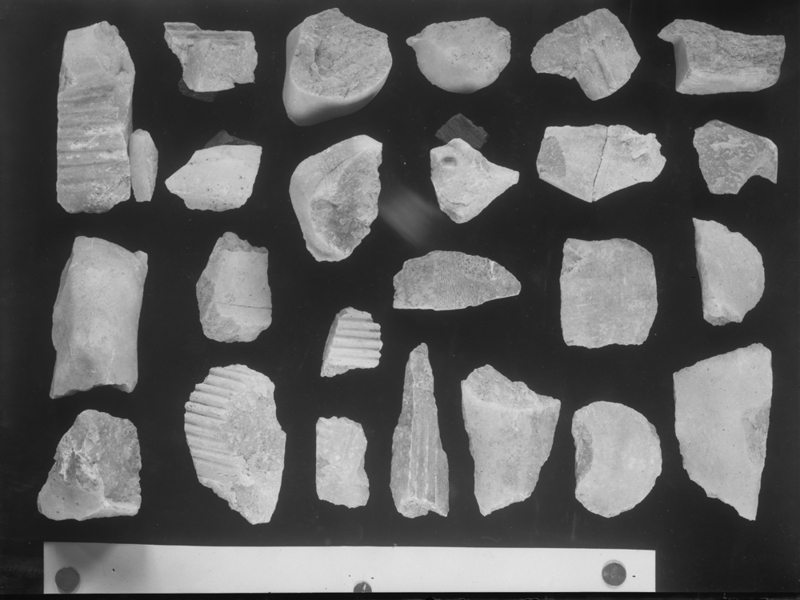 Multiple alabaster statue fragments MFA owned (accessioned). 12-12-176.1 = MFA 47.2116: two fragments forming part of cartouche, belongs with 14-12-49.24 + 14-12-49.26 + 14-12-49.34 + 14-12-49.38 + 14-12-49.44 + 14-12-49.45 + 14-12-49.46, all from same statue; 12-12-176.2 = MFA 47.2117: one fragment, inscribed; 12-12-176.3 = MFA 47.2118: two fitting fragments, portion of arm or leg; 12-12-176.4 = MFA 47.2119: two fitting fragments, portion of chest with lappet; 12-12-176.5 = MFA 47.2120: one fragment, inscribed; 12-12-176.6 = MFA 47.2121: one fragment, inscribed; 12-12-176.7 = MFA 47.2122: two fitting fragments, joins 12-12-176.12; 12-12-176.9 = MFA 47.2123: one fragment, inscribed; 12-12-176.10 = MFA 47.2124: one fragment inscribed; 12-12-176.11 = MFA 47.2125: one fragment, portion of lappet; 12-12-176.12 = MFA 47.2126: one fragment, joins 12-12-176.7; 12-12-176.13 = MFA 47.2127: one fragment; 12-12-176.14 = MFA 47.2128: one fragment, inscribed; 12-12-176.15 = MFA 47.2129: one fragment, ridged pattern; 12-12-176.17 = MFA 47.2130: one fragment; 12-12-176.18 = MFA 47.2131: one fragment; 12-12-176.20 = MFA 47.2132: one fragment; 12-12-176.25 = MFA 47.2133: two fitting fragments; 12-12-176.29 = MFA 47.2134: one fragment, ridged pattern; 12-12-176.31 = MFA 47.2135: one fragment; 12-12-176.32 = MFA 47.2136: one fragment; 12-12-176.35 = MFA 47.2137: one fragment; 12-12-176.37 = MFA 47.2138: one fragment; 12-12-176.39 = MFA 47.2139: one fragment. Miscellaneous stone objects accessioned as MFA 47.2032 (flint), MFA 47.2033 (flint), MFA 47.2034 (flint), MFA 47.2035 (slate vessel fragment), MFA 47.2036 (pierced stone disk), MFA 47.2037 (unidentified limestone object), MFA 47.2038 (faience disc bead), MFA 47.2039 (alabaster vessel fragment), MFA 47.2040 (alabaster model jar), MFA 47.2041 (inscribed limestone cylinder), MFA 47.2042 (alabaster vessel fragment), MFA 47.2047 (limestone servant statue accessory). Smith, William Stevenson. 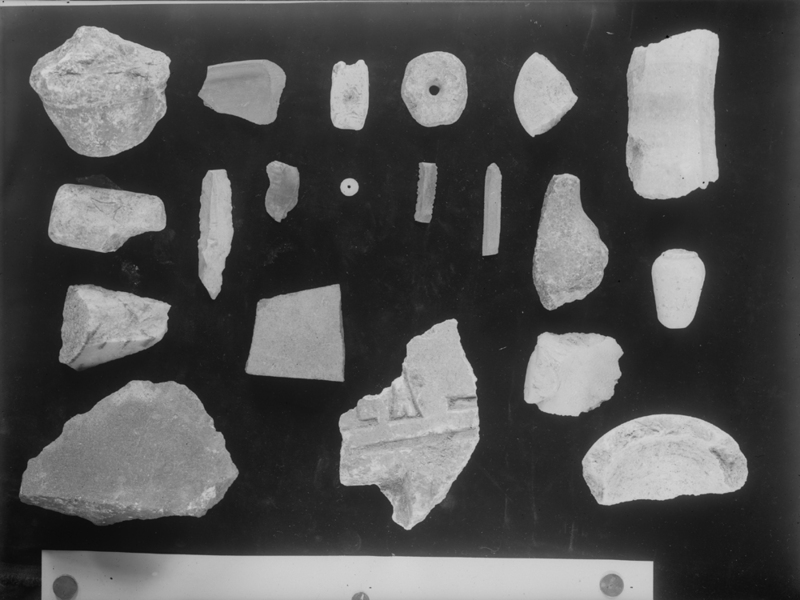 "Fragments of a Statuette of Chephren." <I>Wiener Zeitschrift für die Kunde des Morgenlandes </I>54 (1957), pp. 186-190. Smith, William Stevenson. 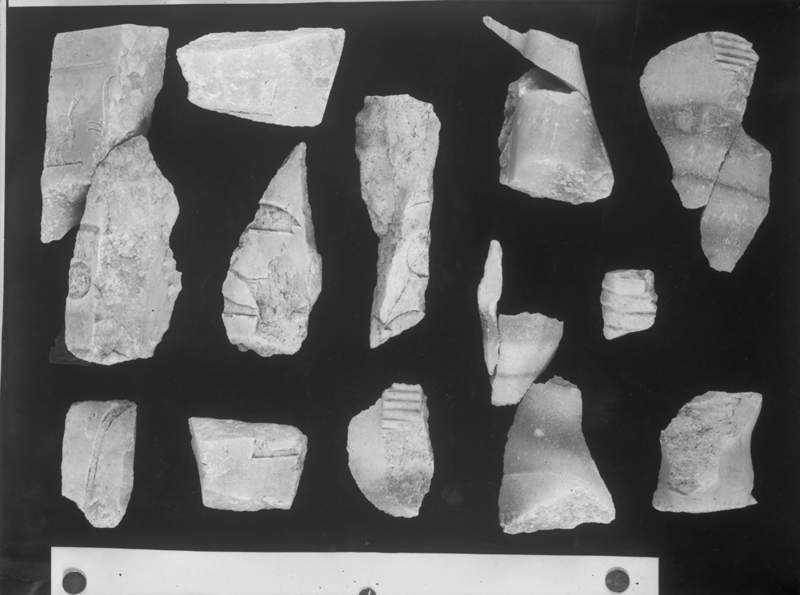 "Fragments of a Statuette of Chephren." Wiener Zeitschrift für die Kunde des Morgenlandes 54 (1957), pp. 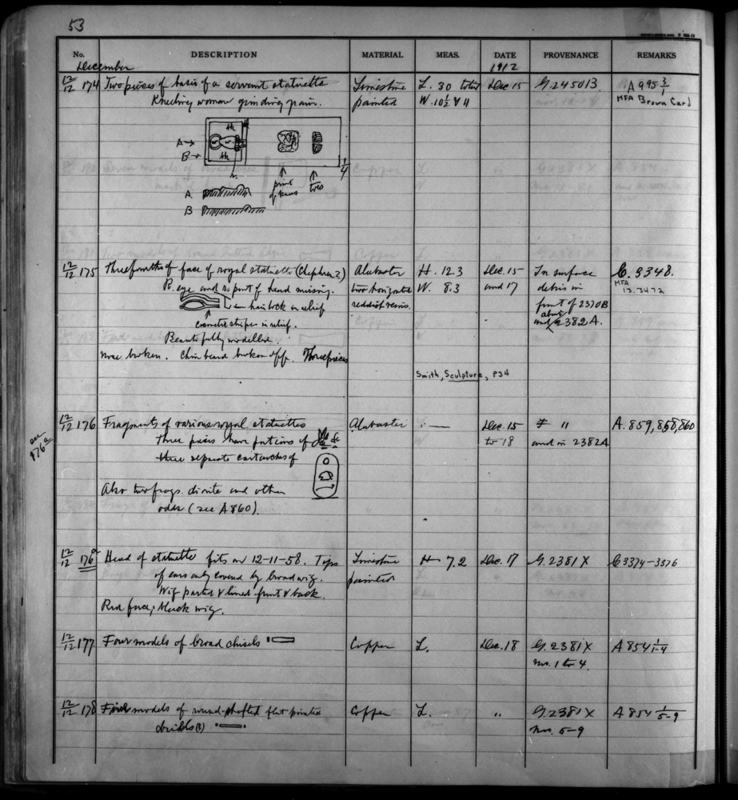 186, 189, fig. 3.